This beautiful book has a simple message about the animals of the earth, sky, and sea: that they be happy, safe, well fed, and have companionship. The book teaches empathy for our furry and feathered friends, that they want what we want, they need what we need. The whole thing is done in under 100 words and with 15 double-page spreads, showing bears, deer, antelope, and lizards on the first page, a V of geese flying over monarch butterflies on fuchsia flowers, a whale swimming with dolphins, a school of fish and other colorful sea creatures including coral, then four spots showing robins, mice, lizards and penguins, all with their babies. The next spread shows a bird flying over the savannah with elephants, antelope, giraffes, zebras, and hyenas. The following shows three spots with sheep, a herding dog, cats, and elephants. The next spread shows a fox with two kits and some lightning bugs. Polar bears and walruses make an appearance on the next pages, and a gorilla and baby share a page with a snail and a frog. 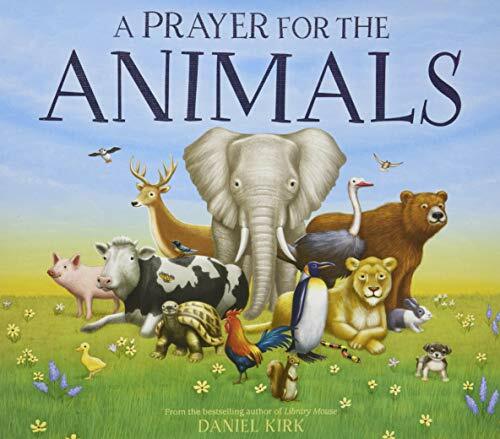 Cheetahs, an octopus, farm animals, hungry pigs, and a mama bear with her cubs round out the last pages with koalas, seals, giraffes, owls, and then an ark-like spread of many running, including ducks and bunnies. The end papers are bright lime green, and the back cover has a pair of mourning doves. It’s a simple, satisfying prayer that can be read again and again to young children, anyone, actually. It could even be the new prayer at a Thanksgiving gathering for those who are spiritual but not religious. We share the Earth with animals. We need to treat them with respect and with care if they are to coexist with the human race.